Abstract: The age and chemical composition of monazite from the Permian acid metavolcanic/volcaniclastics of the Southern Gemeric Unit (from the 1st and 2nd volcanogenic horizons of the Roznava Formation) and the Borka Nappe (the Bucina Formation) was studied by the microprobe chemical method. Monazites from the 2nd volcanogenic horizon of the Roznava Formation as well as from the Borka Nappe occur mostly in the form of small irregular grains about 5–10 μm in size always surrounded by the metamorphic white mica-phengite. Although substantial zonality in single grains was not observed, inter-granular variation in composition is much pronounced and it is mainly attributed to the variation in ThO2 concentration in the range from 0.9 to 14.5 wt. % (5.1 wt. % in average). Monazites from the 1st volcanogenic horizon of the Roznava Formation are larger, ~30–40 μm in diameter, and most of them are showing concentric zonality related to the age. Rounded cores mostly of Permian age are surrounded by Alpine rims. ThO2 concentration is more restricted up to 7.2 wt. %. The average is correspondingly lower ~3.5 wt. %. The majority of the monazites from the Permian acid metavolcanic rocks record an Alpine tectonothermal event around 148±8 Ma. Alpine age data divided according to the statistical modeling present two successive sub-events yielding ages of 167±12 and 136±10 Ma. Jurassic event is interpreted as a strong reworking linked to the subduction/accretion processes. Obduction of the Meliata accretionary prism, and strong subduction-related fluid flow over the Southern Gemeric domain including its Permian envelope unit are presumed. The successive Early Cretaceous (136±10 Ma) compression within the Inner Western Carpathians domain was followed by polyphase Alpine tectonic evolution connected with the gradual Cretaceous collision and indentation at about 100 Ma. The evidence for the Early Permian magmatic event at 276±25 Ma in the 1st volcanogenic horizon of the Roznava Formation recorded in the corroded monazite cores is presented for the first time. Abstract: The Pieniny Klippen Belt is a tectonic melange representing the boundary between the Outer and Central Western Carpathians. Within this melange, Jurassic and Cretaceous sedimentary rocks from deep-water (Kysuca Basin) to shallow-water environments (Czorsztyn Unit) occur. The Nizna Unit of the Pieniny Klippen Belt was distinguished as a particular development of the Kysuca Unit. As a result of a sea-level fall in the Barremian, the Barremian-Aptian Nizna Limestone Formation (organodetritic Urgonian-like facies) rests unconformably on older formations. At the base of this transgressional contact the newly discovered Tvrdosin Breccia Member occurs. This breccia consists of clasts of radiolarites, red limestones, white Calpionella limestones, and black chert nodules extracted from these limestones. The presence of breccia shows that the pre-Barremian strata in the Nizna Unit were eroded to relatively deep levels. This event was coeval with, and probably related to, the hiatus in other units situated on the Czorsztyn Swell. The Nizna Limestone Formation is overlain by the uppermost Aptian to Cenomanian pelagic marlstones, limestones and radiolarites at least 10 m thick. These are followed by flysch with exotic pebble material. Its age is younger than Cenomanian, which contradicts previous opinions. An earlier (Albian) onset of exotic flysches would be indicative of more southern units, close to the exotic Andrusov Ridge. This implies that the Nizna Unit was situated at the northern margin of the sedimentary area of the Kysuca Unit, closer to the Czorsztyn Swell, where the exotic flysch sedimentation came later. Abstract: Trace element contents in six generations of low-temperature (< ~50 °C) pyrite (Py-1 to Py-6) recognized in silicified Cretaceous sandstones near Jenikov in the central Eger (Ohre) Graben, Bohemian Massif, are used to decipher late Cenozoic fluid circulation patterns in the graben. Py-1 and framboidal Py-2 are generally coeval with silica cementation, while Py-3 to Py-6 postdate this process. Py-6 forms inclusions in barite crystals, clearly separated in time from silica cementation. The average arsenic contents of 0.01, 0.15, 2.94, 3.91, 6.14 and 0.76 wt. % As for Py-1 through Py-6 and anomalous average nickel and cobalt contents in the oldest Py-6 inclusions (3.47 and 8.86 wt. %, respectively) indicate the presence of two contrasting fluid circulation patterns in the graben fill during the period of pyrite formation (?Pliocene to Recent). Early fluids (Py-1 to Py-5) are interpreted as progressive deepening, fault-driven fluids originating from acidic volcanics in the basement. The late fluids are shallow, topography-driven fluids in contact with the Tertiary lignite beds. Earlier data from structural geology allow us to explain such change in fluid circulation by regional tectonic stress rearrangement, which inhibited the activity on the Krusne hory Fault at about 400 ka. 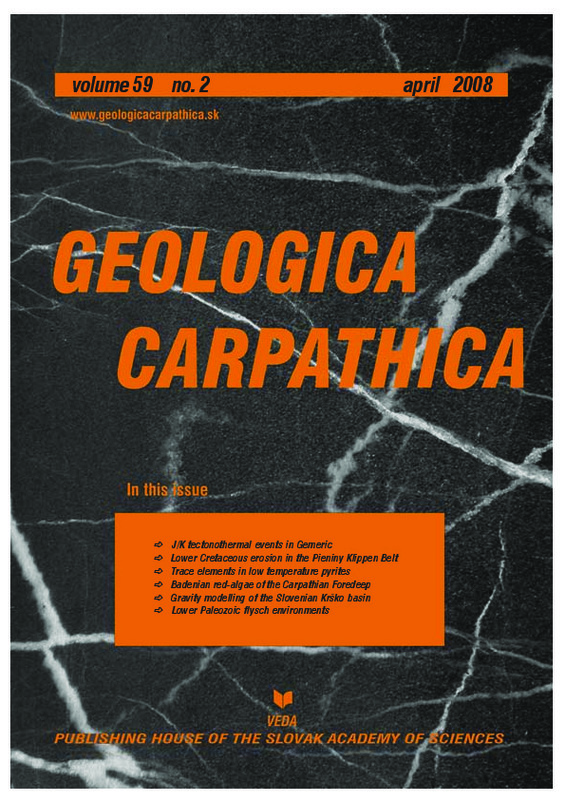 Abstract: The existing data on Lower Badenian red-algal limestones from the Carpathian Foredeep in Moravia (Czech Republic), up to now dispersed in various publications and manuscripts, are summarized for the first time. They are discussed and interpreted according to contemporary carbonate sedimentology and actuopaleontology together with the latest results of field research and macro-/microscopic studies from 16 outcrops (Prace Hill, Zidlochovice, Podbrezice, Bacov, Sudice, Pametice, Sebranice, Svetla u Boskovic, Tisnov-Ochoz, Repka, Lomnice, Olomouc, Hostim, Rebesovice, Blucina and Telnice). The Moravian red-algal limestones originated in a warm-temperate to subtropical climate and, in contrast to the Polish part of the Carpathian Foredeep, their areal extent and thickness are distinctly smaller due to the highly varied basin configuration. The predominating facies of red-algal limestones are biodetrital grainstones (fine-grained grainstones and bioclastic grainstones), coralline branch rudstones–floatstones and rhodolith rudstones. Red-algal limestones on the west and northwest margins of the preserved Carpathian Foredeep in Moravia are connected with the prograding coast line, and their positions in the profiles are not necessarily isochronous. At the eastern margin of the Carpathian Foredeep (immediately in front of the flysch nappes), important role of the redeposition of the red-algal limestones into more internal parts of the basin is supposed. Abstract: Two-dimensional gravity modelling was applied along six seismic reflection profiles measured across the Krsko basin within the framework of seismic hazard assessment studies at the location of Krsko nuclear power plant and for oil exploration. The aim was to provide additional insight into structural interpretation of the pre-Tertiary bedrock of the basin, because the quality of the seismic profiles acquired with various techniques over an extended time span is fairly heterogeneous. The Krsko basin, located on the rim of the Pannonian basin, is filled with up to 2 km of Neogene to Quaternary molasse sediments. The geometry of the gravity models was based on interpretation of seismic reflection profiles from three different surveys. A density of 2.5 g/cm3 was used for the pre-Tertiary carbonate bedrock and values from 2.3 g/cm3 to 2.0 g/cm3 for the sequence of Neogene to Quaternary deposits, composed of marl, sand, silt and limestone. Calculated anomalies were compared with observed gravity anomalies extracted from the two detailed surveys of the area. In general, a good fit was obtained; some exceptions may originate in undetected density variations or in violation of the 2D approximation near the basin margins. The findings of the gravity modelling are consistent with the interpretation of seismic reflection data, which considers the Krsko basin to be a fairly regular syncline without normal faults at the northern and southern margin, assumed in previous works. The modelling showed that gravity data are useful for interpolation of the shape of the basin’s bedrock between seismic profiles. The structural map of the pre-Tertiary basement was constructed showing two depressions with a maximum depth of 1600 and 2100 m.
Abstract: The following Devonian–Carboniferous paleogeographic and Variscan orogenic domains were recognized in the Circum Pannonian Region: Oceanic and arc related environments — Noric Bosnian/Carnic-Dinaric Zone (carbonate dominated passive continental margins) — Inovo Zone (Devonian siliciclastic dominated stable continental margins) — Quartzphyllite Complexes — Carpatho-Balkanic intracontinental rift systems — Variscan Flysch Zone — Carboniferous anorogenic turbiditic siliciclastic sediments at stable margins (Bükk-Jadar Zone) — Carboniferous foredeeps and remnant basins (Veitsch/Nötsch-Szabadbattyan-Ochtina Zone) related to metamorphic zones (Mediterranean Crystalline Zone) formed already during an Early Carboniferous (Late Devonian) orogenic event. The syn-orogenic Variscan Flysch Zone formed in the suture at the leading edge of the colliding terranes (Noric Composite Terrane and Variscan Carpatho-Balkanic terranes) along the Laurussian margin (Eastern and Southern Alps, Western and Eastern Carpathians, Carpatho-Balkanides) N to W of the bay of the Carboniferous Paleotethys. This collision was connected with deformation and partly low grade metamorphism and occurred during a Serpukhovian-Bashkirian orogenic event which is also indicated by an unconformable Moscovian/Kasimovian continental molasse. The Variscan deformation of the East Bosnian Durmitor and Central Bosnian Terranes, situated in the Carboniferous SW of the Paleotethys, is only weak and not documented in a sufficient way. Bükk, Sana Una, Jadar Block and Drina-Ivanjica Terranes remained during the Carboniferous subsiding passive margins in shallowing upward systems. Therefore they lack any Variscan deformation, their turbiditic siliciclastic environments cannot be assigned as syn-orogenic flysch deposits and they are covered within Bashkirian-Moskovian times conformably by marine shallow water sediments.